The annual Thai Vegetarian Festival is now drawing to a close. 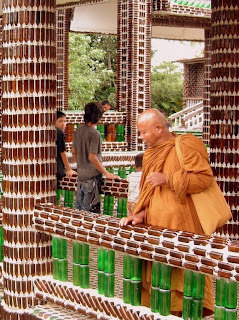 This year in Pattaya it ran from the 7th- 17th October, but as it's a lunar celebration (held during the 9th lunar month of the Chinse calendar) the dates are different each year. 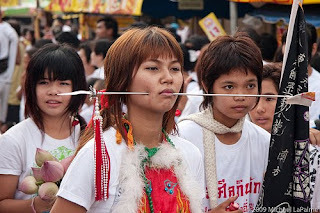 The festival is celebrated by Chinese communities throughout Thailand, although most of the attention is generally focused on Phuket with it's colourful parades and the vegetarian devotees, known as "Ma Song", who perform various feats of courage, such as walking on hot coals or piercing their skin with knives and other sharp objects. Check out these guys........they are all 100% genuine and haven't been edited on photoshop!!! Fortunately, we have not been carrying out any ritual acts of self-mutilation!! And the knitting needles were kept well away from my crown jewels, just in case the missus had any unusual urges!!! Having just returned from a long weekend on the island of Penang and as it was my first visit to Malaysia, I thought it would be a good opportunity to share my thoughts on the destination. I had read extensively about Malaysia on the internet prior to my trip and settled on Penang due to its proximity to Thailand and the fact it had plenty of tourist attractions and historical sights to visit. We flew in style on Air Asia......I am joking of course!!! For those of you unfamiliar with Air Asia they are the Asian equivalent of EasyJet or Ryan Air, a no frills, budget airline who offer cheap flights but you pay for all the extras, including your food and baggage. Our 2 return flights with 2 pieces of checked in luggage weighing 15kg each, cost a little over 8,000 baht (about £170 at the current exchange rate).